How much does it cost to travel to Auxerre? How much money will you need in Auxerre? €90 ($102) is the average daily price for traveling in Auxerre. The average price of food for one day is €27 ($31). The average price of a hotel for a couple is €82 ($93). Additional pricing is in the table below. These average travel prices have been collected from other travelers to help you plan your own travel budget. Auxerre is a town in France on the Yonne River and in the Yonne department of the Burgundy region. Historically, the town owes its importance to its important position on the river, and also to the once important trade route between the Mediterranean and the North Sea. Auxerre has received the classification of a protected Historic Town in France as well as being one of the French towns of art and history. Auxerre is an interesting place to visit, with the town center towered over by the cathedral and by several churches. The part of the town of most interest to visitors occupies the hill that runs up from the west bank of the river, and includes the major churches and the historical old town. The Auxerre churches are some of the most impressive sights here. The best way to get a perspective of the churches is by walking onto the main bridge across the river (the Pont Paul Bert). From here you have a very good view of the Auxerre skyline. From here you can see three main churches - running south to north these are the Church of Saint Peter, the Saint Etienne Cathedral, and the Saint Germain Abbey. The Cathedral Saint-Etienne is an imposing gothic style cathedral built and modified from the 11th to the 16th centuries. Take a look at the carvings around the doorway then pass inside the cathedral to see some of the best known stained glass windows in France, and the fascinating 11th century crypt where you can see remains of the earlier cathedral on the same site and a very ancient fresco. The Abbey of Saint-Germain at Auxerre is also interesting, with the cloisters and other monastery buildings now open to the public, partly as a museum dedicated to the history of Auxerre and region. The abbey is renowned for the frescoes it contains in its crypt which date from the 9th century and are the oldest known church frescoes in France. There are several other religious monuments in Auxerre including the Church of Saint-Pierre, the Church of Saint-Eusebe and the Visitandines Chapel among others. The Marine quarter - the old sea-fearers- quarter has maintained its twisting roads, which are often bordered by wood-paneled houses. Its main areas are Saint Nicolas square, Coche-d'Eau square and lastly, the rue de la marine, with its remnants of a tower of the old Gallo-Roman perimeter wall. Auxerre is much more than just crypts and churches - the city center itself has a great deal to offer as you explore. There are attractive squares where you can take a rest in a cafe, joined by narrow medieval streets and a myriad of attractive ancient houses, often with half-timbered facades. The Old Town is now a region of protected development. The highlight is the old town gateway in the heart of Auxerre Old Town, a 15th century clock tower where the ochre and gold colored sundial and moon dial can be seen. The tower is in the heart of the pedestrianized center of Auxerre. The rest of the old town should also be explored, especially in the section of town between the Town Hall and the Saint Etienne Cathedral, where you will discover various other interesting buildings. Take a self guided tour of the city's main sights. Ask for the map at Auxerre Tourist Office - they have a paid version which suggests a route to be followed and an 'under the counter' free version which also shows the highlights. The main Tourist Office in Auxerre is next to the river, although a smaller one can also be found near the clock tower. There are two museums in Auxerre that are of interest to visitors. One is the Museum Leblanc-Duvernoy featuring tapestries and furniture, while the other is the Natural History Museum. Auxerre has some great options when it comes to food and dining. There are a few specialty dishes to watch for including: Gougere, baked choux pastry made of dough mixed with cheese; Bouef bourguignonne, a typical main dish made of beef and vegetables; and Truffle bourguignonne, Truffles from Burgundy. 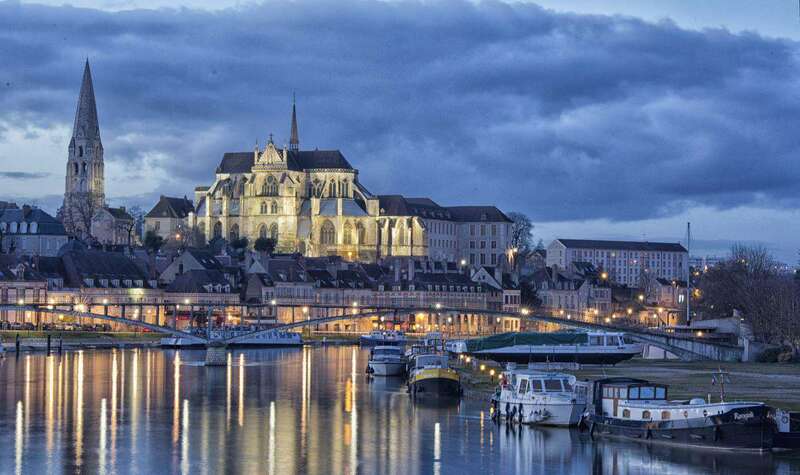 Auxerre is also noted for its production of Burgundy wine, including world-famous Chablis. For a few ideas for restaurants you could try: Le Marais, for some traditional French cuisine; Le Palmeraie, which offers French cuisine with a Mediterranean inspiration; and Les Brimbos if you're looking for more pub-style dining. The closest international airport is Paris. Trains are a wonderfully cheap option if you are coming from Paris or Dijon. Trains usually run every hour. If you are coming from Paris, you might have to make a connection at Larroche-Migennes. You can easily walk from the station to the old part of town in 10 minutes. Auxerre is located half way between Paris and Dijon on the A6 motorway, at the junction of the proposed A26 Troyes-Bourges motorway. The city is ideally situated to discover northern Burgundy. There are free mini buses that circle the periphery of the old town as well as a bus system that services suburbs. Auxerre is small in area, so walking is highly recommended for most purposes and is a pleasant thing to do in the old city.